Labour, Liberal Democrat and UK Independence Party (UKIP) leaders have delivered Prime Minister David Cameron an ultimatum, claiming they will participate in televised pre-election debates without him if necessary. 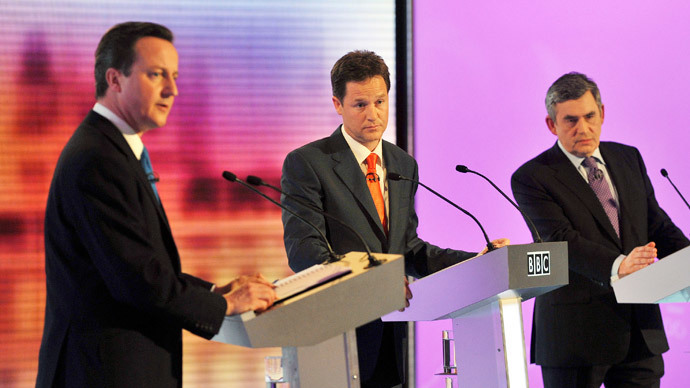 In a series of letters, which were sent separately but feature identical wording, Nick Clegg, Ed Miliband and Nigel Farage informed Cameron if he failed to consent to the debates they would participate regardless, leaving an empty chair for the PM should he have a last minute change of heart. Cameron claims he is boycotting the debates after Ofcom made the “unfair” decision not to allow the Green Party to participate because they are too minor. The Telegraph, however, revealed that the Conservatives were attempting to block the debates from going ahead because they may cost Cameron precious votes. Talks are ongoing between representatives of Labour, the Conservatives, LibDems and UKIP, but reports suggest that difficulties presented by the Tory camp risk the events being canceled altogether. The letters present the other leaders as trying to publicly force Cameron into playing fair. “These debates are not the property of the politicians and I do not believe the public will accept lightly the prospect of any politician seeking to block them,” the letter adds. A Downing Street spokesperson claimed Cameron’s position remains unchanged. The letters will, however, hugely increase public pressure on the PM to take part. The pre-election series would feature a debate between the four leaders, including UKIP’s Nigel Farage, a debate featuring the Conservatives, Labour and LibDems, and a final head-to-head between Cameron and Miliband. The Green Party responded with a letter of its own, from leader Natalie Bennett to Miliband, Clegg and Farage. She claimed a “substantial majority” of the British public would like to see the Green Party included in the debates. Bennett also said it would be more progressive if the three leaders were to suggest to broadcaster ITV they would be willing to include the Greens as a means of also including Cameron. Speaking on Radio 4’s Today program, Farage said Cameron seemed unwilling to debate topics like immigration with the UKIP leader.